The BGM volleyball team hosted Lynnville-Sully on Thursday, Sept. 14, looking for their first match win of the season. But the Hawks made it a quick night and swept the Bears in three sets. L-S won the first set 25-15, the second set 21-13, and the final set 25-22. The first and second games were not close, with the Hawks easily defeating the Bears. However, the third game was a close battle the whole way. The Hawks would get a lead, but then the Bears would fight back. In the end, L-S pulled out the win to conclude the night. Senior McKinley Conover battles at the net with a player from HLV during Saturday’s tournament. The Hawks had a great night of serving. They had a 95 percent success rate on serves, making 87 of 92. Senior Skyler Young, junior Carson Fisk, and junior Shiloh Cunningham all had 100 percent efficiency on their serves. Two seniors, McKinley Conover and Camryn Russell, only missed one serve apiece from the service line. Camryn Russell served the most, with a total of 27 attempts. Young had a great night with 11 assists and four digs. Fisk led the team with 13 digs. Conover had 11 digs and three kills. Overall, the team had 15 assists, 55 digs, and 16 kills. The theme of the BGM game for the Hawks was to work together as a team and have fun. This was well displayed during the game as the Hawks battled out the last game, which was close, and took the victory. “This game was a major turning point for our team. We all finally played together and learned how to stay on a high level throughout the game,” said Russell. “We came out and played as a team. We weren’t only competitive, but we also had a lot of fun at the same time,” said Conover. BGM came into the game with no wins, having lost all 14 matches this year. The Hawks came into the game with a better record of 3-6. Even though the Bears have had more game time experience, the Hawks were able to beat out the rivaling team. Lynnville-Sully volleyball team members who were runners-up at the North Mahaska Tournament are, from left, front: McKinley Conover, Camryn Russell, Skyler Young, Mariah Vos; back: L-S Assistant Coach Kyra Smith, Shiloh Cunningham, Carson Fisk, Makayla Rozendaal, Mallory Loftus, Krystal Van Dyke, Korinne Jansen, Janelle Rozendaal, L-S Coach Jayme Deal, and not pictured: Madison Johnson. 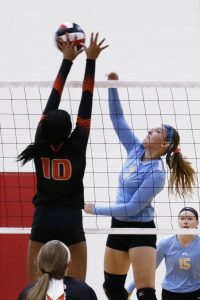 Two days later, the Hawks headed to North Mahaska and faced off against four different schools in five matches during a Saturday tournament. The girls went 3-2 overall on the weekend and got second place out of eight teams, improving from fourth place last year. The first three games for the girls were in pool play. They defeated Grinnell and Sigourney before losing to HLV. With the two wins in pool play, they then advanced to bracket play, where they met up with PCM. 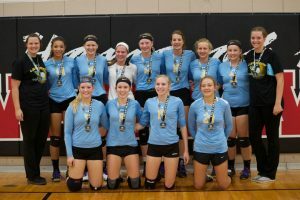 They defeated the Mustangs in two sets, which advanced them to the championship against HLV. Again, the Hawks lost in three sets. Against the 4A Grinnell Tigers, the Hawks led for most of the first set but lost 21-19. From there, the girls bounced back and took the next two sets by scores of 21-18 and 15-10. The Hawks served well, connecting on 91 percent of their serves, getting 100 percent efficiency from Cunningham and Fisk. The next match was a conference battle against Sigourney. The first game was a rough one for the Hawks as they lost 21-12. In the next set, the Hawks did a great job of bouncing back and won the game 21-19. They then finished off the Savages in the third set, 15-13. Young played a key role in the win with nine assists, seven digs, and perfect serving (11 of 11). The third game of the day was against HLV. The Hawks lost a close one in the first set, 21-19, and came back to win the second set, 21-15, before losing the third match 15-6. Junior Makayla Rozendaal, Fisk, and freshman Korinne Jansen led the team with seven digs. Young had 11 assists. Cunningham and Fisk had six and five kills respectively. The Hawks took on PCM in the fourth game on Saturday, winning 25-15 and 25-17. Russell, Fisk, and Cunningham had perfect serve efficiency. Young led the team in assists with 11, and Conover led in digs with six. Loftus and Fisk had four kills apiece. The fifth and final game was against HLV in the championship on Saturday. It was another exciting game against the Warriors. The Hawks started off strong the first game with a 25-22 win. The second game also ended 25-22, but was a L-S loss. The Hawks dropped the third set 15-11. Loftus was the top attacker with eight kills. Fisk led in digs with 12, followed by Conover with nine. Young added 11 more assists in this game. A new week started out with the Hawks’ old rival, Montezuma, on Monday, Sept. 18. The Hawks kept right with the 10th-ranked Bravettes (15-3) but fell in four sets: 23-25, 19-25, 29-27, and 17-25. It was a “well-played battle,” according to Deal. L-S totalled 31 kills, including eight from Conover and six each from Fisk and Russell. Conover was also the top digger with 32,followed by Fisk with 25 and Young with 12. Cunningham made all 21 serves with four aces, and Young went 25-of-26 from the service line with one ace. The Hawks had 17 total blocks, led by Loftus with seven. The L-S netters (7-9) get a break in action with their next match scheduled for Monday, Sept. 25, hosting North Mahaska.